Calla is a fish out of water. Or a wolf out of, er, whatever wolves prefer to be in. Certainly, she's no longer in Vail – the home that, during Nightshade, she came to realise was more a prison than anything else. Having escaped the clutches of the Keepers with Shay she wakes up in the grasp of the Searchers, her erstwhile enemies, with the crushing knowledge that she has abandoned her pack – and Ren – to the mercy of her old masters. As she slowly learns to trust the Searchers they formulate a plan to rescue her pack but it's all terribly risky and waiting in Vail are the Keepers... and their wraiths. In Nightshade, Calla emerged as one of the more interesting YA protagonists. At once an incredibly strong leader and a vulnerable, confused girl she handled the situations in front of her with realistic inner conflict. One of her best traits, however, is that she sticks to a course of action once she has decided on it and this very much comes to the fore during Wolfsbane. This leads to much inner conflict and the guilt that she feels over abandoning her pack is palpable, as is the turmoil this inevitably creates in her relationship with Shay. Her ties to the pack and, somewhat surprisingly, to Ren often overwhelm her and her desire to reunite them all in a safe place is believably wolfish – she literally can't function properly outwith a pack. As the story progresses Calla is also increasingly overwhelmed with difficult truths as the Searchers educate her on the true history of Keepers, Guardians and The War of All Against All. Again, her horror at the reality of her old life is extremely well written and she continues to struggle with this throughout Wolfsbane which is refreshing to read in a genre where all too often protagonists shrug off major changes with nary a sigh. 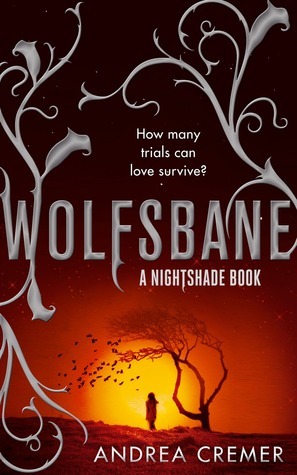 Wolfsbane has a much smaller character base than Nightshade, focusing mainly on Calla, Shay and the small group of Searchers who are reluctantly welcoming them into a brave new world. Shay isn't quite as strong a character as he was in Nightshade, mainly because he is only just learning of his own potential – something that will surely come to the fore in book three (because, of course, this is part of a trilogy). However, he is extremely likable, protective of Calla while allowing her space and understanding of her difficulties while not necessarily understanding her conflict completely. He's basically a nice bloke. The Searchers are an interesting group. While leader Monroe is fairly predictable, the tempersome Ethan, sly Ariadne and infuriatingly odd Silas more than make up for their leaders rather tiresome enigmatic manner. As in Nightshade, Cremer excels at group dynamics and her handling of this new team is no exception. Plot-wise, Wolfsbane is pretty straightforward with Calla and the Searchers planning and executing a rescue mission. It's an interesting process as they clearly have different motivations for doing so and Shay is unable to assist at all (being the blessed Scion, whatever that is). There are some lovely set pieces both action-filled and quiet and Cremer's writing is always intelligent and pacy. Much like Nightshade, however, what makes this title stand out is the author's willingness to stray into darker territory. The Keepers, pretty horrific in the first book in the series emerge as even nastier pieces of work than previously thought. They literally treat the Guardians like dogs, controlling every aspect of their lives (including, chillingly, their menstrual cycles) and using them in the worst possible ways. There is a scene later in the book between Calla and a fellow Guardian where she is left literally with her back against the wall – all due to the Keepers machinations. It's all terribly well done and bodes well for a compelling and unpredictable final book in Andrea Cremer's not-just-another-werewolf series. This review was brought to you by Splendibird. Wolfsbane (and indeed the last in the trilogy, Bloodrose) is available now. It may or may not have taken us over two years to find the draft of this in a long lost folder.